To build a solid industrial relations -- Vice President Director of PT Toyota Motor Manufacturing Indonesia (TMMIN) Warih Andang Tjahjono accompanied with other TMMIN’s Board of Directors Mamoru Akiyama and Bob Azam – a picture with Directorate General of The Development of Industrial Relations and Workers Social Security of Republic Indonesia of Manpower Ministry Dra. Haiyani Rumondang, MA, General Chairman of Indonesian Labor Union Confederation Yorris Raweyai and Chairman of DPN Apindo Harijanto, and Chairman of PUK SP-LEM TMMIN, after signing MoU (memorandum of understanding) between TMMIN Management and TMMIN Labor Union in a 2015-2017 period at TMMIN headquarter, Sunter Jakarta, at Monday 14 September 2015. 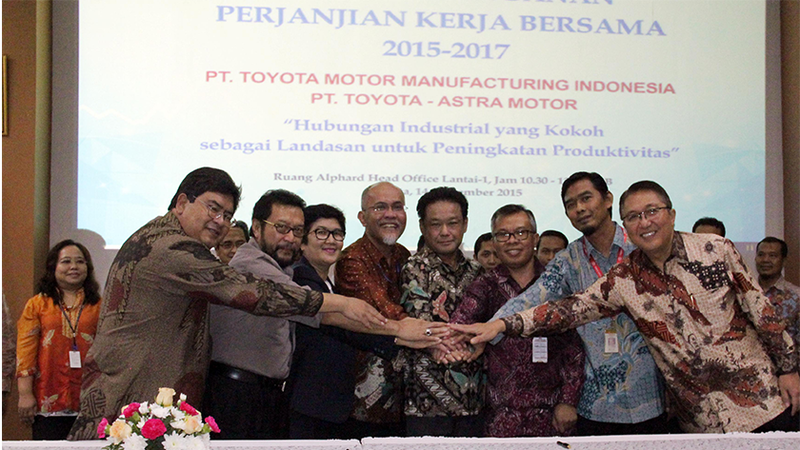 The MoU is efforts to build a harmonious and solid industrial relations in Toyota Indonesia workplace in accordance to mandate of statutes 13/2003 (UU 13/2013) about manpower amongst others about productivity enhancement and work competency certification.